The Lone Ranger was named so because the character is the only survivor of a group of six Texas Rangers, rather than because he works alone (as he is usually accompanied by Tonto). A posse of six members of the Texas Ranger Division pursuing a band of outlaws led by Bartholomew “Butch” Cavendish is betrayed by a civilian guide named Collins and is ambushed in a canyon named Bryant’s Gap. Later, an Indian named Tonto stumbles onto the scene and discovers one ranger is barely alive, and he nurses the man back to health. Tonto recognizes the lone survivor as the man who saved his life when they both were children. According to the television series, when Tonto left the Reid place with a horse given him by the boy Reid, he gave Reid a ring and the name Kemo Sabe, which he said means “trusty scout”. Among the Rangers killed was the survivor’s older brother, Daniel Reid, who was a captain in the Texas Rangers and the leader of the ambushed group. To conceal his identity and honor his fallen brother, Reid fashions a black domino mask from the material of his brother’s vest. To aid in the deception, Tonto digs a sixth grave and places at its head a cross bearing Reid’s name so that Cavendish and his gang would believe that all of the Rangers had been killed. Hmm. This sounds interesting. My thoughts immediately went back to the fall of 1968. Our family was home on furlough from the mission field of Colombia and I went on a ministry trip with my father to the west coast while all the other young people of our church community (Bethany Fellowship of Bloomington, MN) went on a retreat at a camp in northern Minnesota. Tragically, a tornado hit the camp and the young people in my class were killed leaving me the sole survivor. These were the kids that I had gone to Confirmation class with. They would have grown up to be my friends, associates, and contemporaries in ministry. However, some of their parents and relatives have had a special place in their hearts for me ever since and have prayed for and supported me in ministry over the past fifty years. 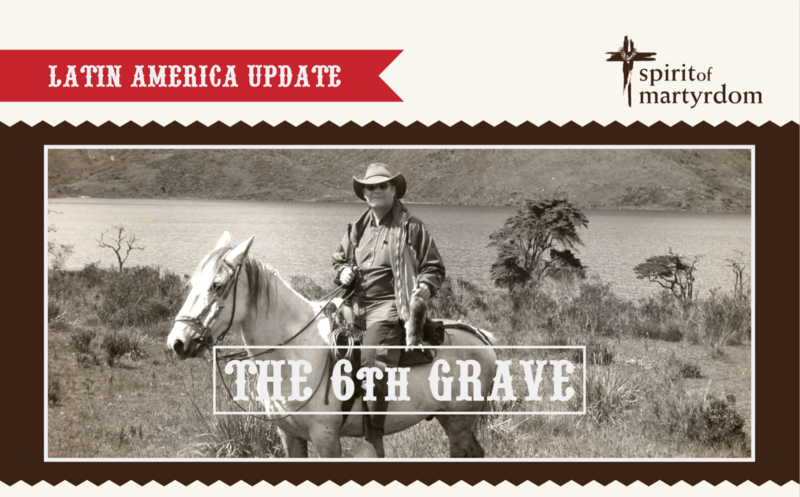 Unless there are a sufficient number of people who understand the above truth, and the significance of what that sixth grave meant to the Lone Ranger, “this government of the people, by the people, and for the people” will fail. For the health of society, and of our nation, there must always be those who will stand alone, if need be, for truth and justice, willing to go against the groupthink of the secular or religious crowd, and against corrupt special interests and private kingdoms to set an example for others to follow. He rarely referred to himself as the Lone Ranger. If someone’s suspicion were aroused, the Lone Ranger would present one of his silver bullets to confirm his identity; but many times someone else would attest on his behalf. The origin of this name was, following the Bryant’s Gap ambush, Tonto observed him to be the only ranger left—the “lone ranger”; Tonto’s choice of words inspired him to call himself “The Lone Ranger”. The Lone Ranger is a symbol of the brave circuit riding preachers, judges and marshals (riding alone or with one or two sidekicks unless circumstances warranted a “posse”) that only feared God and tamed the wild west, heralding well over a century of peace and safety not only for women, children and minorities, but their heroic actions ensured liberty for everyone to pursue happiness and worship God according to each individual conscience. This is unique in world history. In the lawless environment of the eastern Colombia cattle country we had many encounters with desperate criminals and always came out on top without ever having to shoot to kill. In one famous encounter I faced down a notorious bad guy who came to our place to wreak havoc with only one “silver” bullet left in my gun. These were special extremely precise bullets that I molded and reloaded on my own. After morning chores, I used to sit in the bushes beside a salt lick (reading C.S. Lewis) and shoot pigeons that were attracted to the salt. With one box of 50 of my special bullets I shot 51 pigeons through the neck or head (two lined up for one shot) and this always made for a good lunch. I also dropped a wild bull with one shot to the head, won shooting contests against nefarious characters, and shot an untold number of snakes through the head including a bushmaster over ten feet long that killed one of my horses (the horse died fifteen minutes after being struck). My brother killed a 22 foot anaconda, with a single shot, in the middle of a swamp in the dark, without a flashlight, that had a strangle hold on his dog. Following my miraculous release from the kidnapping on January 3, 1984 (brokered by my brother, Chad) I turned the ranch over to him and entered full time travelling ministry all over North America and Colombia. Since that time (33 years ago) I never carried another firearm, except on special occasions. Now my “silver bullets” are facets of the truth of God that I have been able to share and witness to the men and women and leaders of all the sides of the conflict. In fact, so many have come to Christ that the FARC conflict has ended. Some of the most dangerous trips I have ever made were over the “paramo” or high alpine Andes above the tree line into territory that had been held by rebels ever since 1917. No churches or religious meetings of any kind were allowed. We went in with 10,000 back packs to give out to all the children filled with Bibles, books, solar powered radios, toys, clothing, school supplies etc. and recruited the children to evangelize their parents, the guerrillas and the army soldiers. The Lord provided me with two brothers to run the radio station I placed on top of a 13,500 ft. peak and as guides. After several almost fatal experiences with horses that failed, my guides bought me a wonderful high mountain stallion that I named, Silver. Some seem to think that God brings forth his people in “clusters,” (or in community in perfect “order” under the authority of “elders”) instead of God cleansing individuals by his Spirit and joining them together after they are clean. Bear in mind, however, that in order for elders like Abel, Enoch, Noah, Abraham or many others to participate in such wonderful wholesome clusters a very important prophetic event must happen called the first resurrection (Revelation 20:4). For we are still in the time in which seemingly indistinguishable wheat and tares grow together in the same field as they both come to maturity. At the time of the harvest, however, the “wheat” bears good fruit and the “tares” produce deadly poison. Apostles, prophets, evangelists, pastors and teachers are given directly by God (Ephesians 4:7-16). They are a gift from God to the body of Christ and are not to lord it over everyone else, but to serve. They represent the authority of God but they are not an intermediate clergy class between the people and God like the Levites and priests of the OT for there is only one mediator of the New Covenant (1 Timothy 2:5, Hebrews 8:6). Without coming to maturity in Christ it is not possible to do anything worthwhile (because without him we can do nothing). It is not difficult to attain this maturity because Jesus Christ is already mature (perfect) and if we are hidden in him this solves the problem. It does not have to take decades for us to learn this. It may happen quickly or there may be those who struggle for a very long time against the government of God unnecessarily. David was king, but he did not desire to subdue the people of God under him. David let God do it. If the Lord has anointed any of us for ministry, like he did with David who was an example of prophet, priest and king (all in the same person), which is our inheritance in Christ, then we do not have to be concerned with subduing the people under us. If God has indeed given us authority, he will take care of it at the proper time. Jesus came as Son of God, but also as Son of Man. He is the promised seed of Abraham and Son of David. Jesus overcame as a man, but the fullness of the presence of God dwelt inside of him. Anyone that loves the truth will love Jesus. Jesus guidance was internal. His heart was indelibly linked to the heart of his Father. There is no evidence in Scripture to suggest that Jesus ever depended upon external guidance from man once he came to maturity (at about thirty years of age) and began his ministry. Jesus did not consult or depend upon elders or prophets (or even his own disciples) regarding his plans, journeys or any other facet of his ministry. Most of the priests, scribes, elders and Pharisees undoubtedly saw Jesus as a lone ranger. They thought that if they could kill him the confrontation would be over. The new song is sung upon a psaltery and an instrument of ten strings. The law of sin and death is based on Ten Commandments, but the “psaltery” of the grace of God brings forth the startling notes of deliverance and freedom by the Law of the Spirit of life in Christ, Jesus (Romans 8:2). The native tongue of our adversary, the Devil, and his (strange) sons is to speak vanity (excessive pride that is worthless and futile). They derive their authority (the right hand is symbolic of authority) from falsehood. Even though they lie, they attempt to trap us by holding us to their version of the truth. They are essentially lawless, but they want to trap us if we do not comply with their interpretation of the letter of the law. Jesus decided to tip the balance of the trial so that he could legally die for us and so he responded, Ye say that I AM. When Jesus pronounced the sacred name, the trial ended (Luke 70, 71). Jesus is the only human being that could truthfully pronounce that Name, declaring his eternal existence. This caused him to be sentenced to death by vain human elders. Approximately 2000 years of human history had gone by up until Abraham and in this entire period Scripture only mentions three men previous to Abraham as outstanding and pleasing to God (Abel, Enoch, and Noah). I recently did a study of the 192 Scriptures that mention “elders” (See Appendix A) and found that even though it is God’s goal and plan for each and every one of us to come to maturity in Christ most of the examples in Scripture are of ungodly elders (who have come to maturity in the nature of Adam). The word, elder, has to do with maturity but we must keep in mind that maturity as “wheat” is one thing and maturity as “tares” is quite another. Acts 11:30 mark an important turning point with the first mention of reliable elders in the NT. Twelve is a number that symbolizes Divine Order (as opposed to man’s order represented by human elders). Twelve squared, one hundred and forty-four, (and remember we are in Psalm 144) represents the consequences of Divine Order (i.e. redemption). One thousand represents perfection. Therefore one hundred and forty-four thousand represents the perfect number of all of the redeemed. They are the only ones who can sing the new song.